Merocoris distinctus feeding on flower stem of Coreopsis lanceolata. This is Merocoris distinctus, a true bug in the family Coreidae whose members are usually recognized by their distinctive flattened hind tibiae (and hence the common name, leaf-footed bugs). This diminutive species, however, lacks that character, instead sporting strangely curved hind tibiae along with club-shaped (incrassate) hind femora. It’s a chunky little species – much smaller than the typical leaf-footed bugs seen across North America, and is most often encountered in grassland habitats where it feeds on herbaceous plants such as goldenrod, Solidago spp. (Slater and Baranowski 1978). This individual was seen probing the upper flower stem of lanceleaf tickseed, Coreopsis lanceolata, during May of last year at Shaw Nature Reserve in east-central Missouri. I’m not sure how well the life history of this species is understood, but I did find one interesting record of twelve individuals feeding gregariously on a dead chicken (Engelhardt 1912)! Apparently, feeding on carrion and other extra-phytophagous foods such as bird droppings and dung is a not uncommon practice among the Coreidae and closely related Alydidae (Adler and Wheeler 1984). I kind of lucked out with this shot – I’d just gotten my new camera two weeks earlier and can’t say I really knew what I was doing at this point. I had first noticed and photographed the bug sitting on top of the flower but totally blew the exposure due to the flower’s bright yellow color. My clumsy approach also caused the insect to move under the flower, where I watched it settle down and begin feeding before trying another shot. The dorsal surface of this species is mottled gray and brown, allowing the bug to blend in with most backgrounds. The underside of the body, however, is thickly matted with white hair, providing a very nice contrast with the black background that I stumbled upon achieved in this photo to emphasize the distinctive appearance of this often-overlooked insect. Photo Details: Canon 50D w/ 100mm macro lens (ISO 100, 1/250 sec, f/14), Canon MT-24EX flash (1/4 ratio), undiffused. Typical post-processing (levels, minor cropping, unsharp mask). Adler, P. H. and A. G. Wheeler. 1984. Extra-phytophagous food sources of Hemiptera Heteroptera: Bird droppings, dung, and carrion. Journal of the Kansas Entomological Society 57(1):21-27. Engelhardt, G. P. 1912. A hemipteron on carrion. Journalof the New York Entomological Society 20:294. Slater, J. A. and R. M. Baranowski. 1978. How to Know the True Bugs. W. C. Brown Company Publishers, 256 pp. This entry was posted in Coreidae, Hemiptera and tagged entomology, insects, Missouri, nature, science, true bugs. Bookmark the permalink. I used to collect another species of Merocoris in Southern California. It has been a long time since I have seen one, although your species does occur in Virginia. I guess that would be Merocoris curtatus. Your timing is impeccable, Ted. I was just looking at some photos of a similar bug that meandered about my patio one afternoon. I was about to hunt down its identity, but thanks to your post I know the answer. Thanks for your timely help! Years ago, Colwell Cook and I did some studies on another Coreidae, the squash bug. It will only develop and mate on squash. However, it will feed on a remarkable variety of plants (although) not for very long at any time. We concluded that they were opportunistic feeders in the sense of ingesting just enough water and nutrients to get them to the next plant. If the next plant was squash, they would stay. If not, they would move on. Many of the predatory bugs, such as Podisus, will opportunistically feed on plants. People who rear them often feed them green beans. 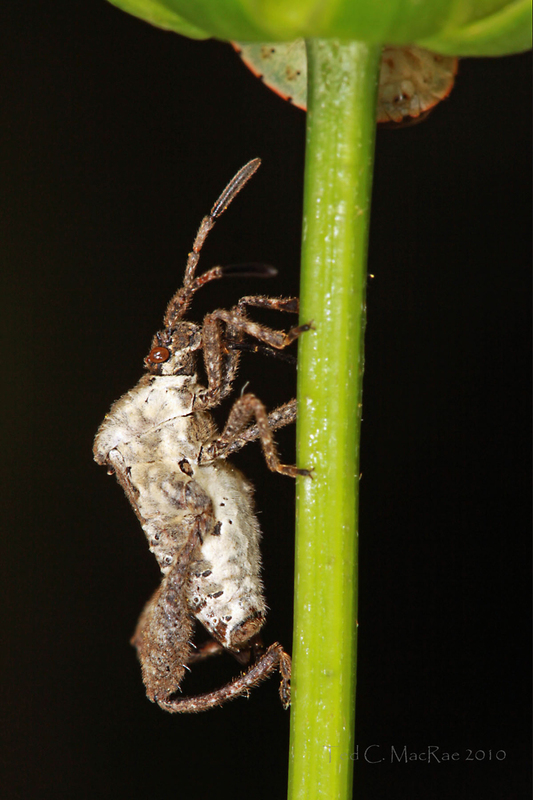 My impression of the Heteroptera is that the group as a whole feeds opportunistically, but reproduction and development requires more specific food sources. Interesting. I suppose the evolutionary origins of the order as a whole are predaceous, at least based on the habits of most of the more basal families. There also seems to have been a lot of switching from predatory to plant-feeders and back to predatory again. You’re right – a very opportunistic order. I’m seeing a lot of Alydus on on persimmon-sweetened coyote and raccoon droppings the last few weeks (butterflies, grasshoppers, too). Now Ted, you trying to stir up some sh…? That bug looks like a tough customer. I’ll have to keep an eye out on my Coreopsis lanceolata to see if any of them wander this far north. Any idea what the dense white pubescence on the underside is for? Even the legs and antennae seem unusually hairy for a coreid, but I suppose that could be because it is such a good picture. Hi Dave. Unfortunately, I doubt this species gets up into your neck of the woods. I think Anne (below) has it right regarding the function of the white underside, considering how cryptically colored they are on their dorsal surface. Strange, though – like most coreid bugs they do have stink glands for defense, but maybe it’s a case of the more tools in the arsenal the better. As small as it is, it may not pack enough of a punch in its stink glands to effectively deter predation on stink alone. I also note that they are a much harder-bodied species than other coreids, at least the smaller ones which tend to be rather more flimsy flattish. Every new picture brings forth a thousand questions! I’ll be on the lookout for this tiny bug on my goldenrod. I love that your photo shows the white underside that helps camouflage him from below. Thanks, Anne. I think you might have answered Dave’s question above. I just caught one yesterday on blooming Desert Broom in Sonoita, AZ. Same place as another one last year. Don’t know the sp yet. In the west it should be Merocoris curtatus.